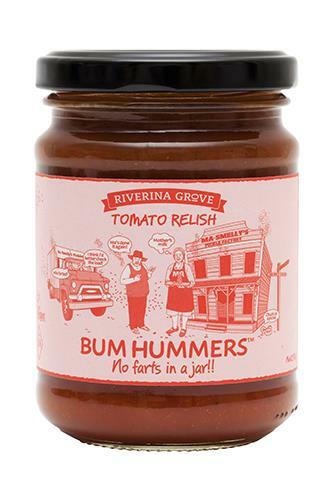 Our Bum Hummer Relish comes from good old fashion recipes. Using fresh diced tomatoes and secret herbs and spices with a hint of sweetness, it is a great combination. Our Bum Hummer Relish comes from good old fashion recipes. Using fresh diced tomatoes and secret herbs and spices with a hint of sweetness, it is a great combination. 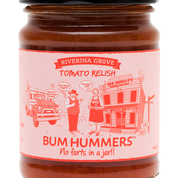 Use Bum Hummers Tomato Relish on sandwiches, sausages and pour over cream cheese as a dip with biscuits. Not only is this a fantastic product, but it also has the humour without the farts.